Our selection of Cat 6A (Augmented) bulk cable includes theCat following varieties: Cat 6A UTP (Unshileded Twisted Pair) Solid Conductor Riser Rated, Cat 6A UTP (Unshielded Twisted Pair) Plenum Rated, Cat 6A FTP Shielded Solid Conductor Riser Rated, Cat 6A FTP Shielded Plenum Rated, and Cat 6A FTP Shielded Stranded Conductor. All rolls of our Cat 6A cable come in 1000 foot rolls. The TIA specifications for Cat 6A Ethernet Cable has limits on alien crosstalk in cabling systmes. Augmented Cat 6 Ethernet Cable has to operate at a minimum frequency of 500MHz fot. It helps future proof your network and supports 10 Gbit applicatoin up to a maximum distance of 100 meters on a 4-connector channel. ABA Elite Cable products are among the best quality cables that money can buy. Satisfaction is 100% Guaranteed. ABA Elite puts more emphasis on state of the art R&D than any other and is one of the world’s largest and most respected cable manufacturers..
Category 5 Cable - Category 5e cable is an enhanced version of Category 5 that adheres to more stringent standards. It is capable of transmitting data at speeds of up to 1000 Mbps (1 Gigabit per second). Category 6 Cable - Category 6 cable was designed to perform at frequencies of up to 250 MHz and offers higher performance for better transmission of data at speeds up to 1000 Mbps (see comparison chart below). Some properly installed Category 6 cable will also support 10 Gigabit speeds, but likely with limitations on length (look for our upcoming Category 6A / 10 Gig tutorial). Augmented Category 6 (6A) - Category 6A cable is the latest twisted-pair cable type defined in February 2008 under the newest version of the TIA 568-B standard (568-B.2-10). Category 6A operates at frequencies of up to 500 MHz and can support transmission speeds at 10 Gigabits per second (Gbps). 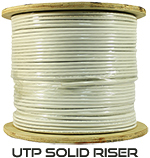 UTP (Unshielded Twisted Pair) - Used primarily for data transmission in local area networks (LANs), UTP network cable is a 4-pair, 100-ohm cable that consists of 4 unshielded twisted pairs surrounded by an outer jacket. Each pair is wound together for the purposes of canceling out noise that can interfere with the signal. 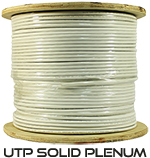 UTP cabling systems are the most commonly deployed cable type in the U.S.
Solid-conductor cable is designed for backbone and horizontal cable runs. 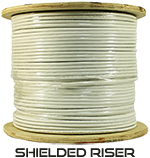 Use it for runs between two wiring closets or from the wiring closet to a wallplate. Solid cable shouldn’t be bent, flexed, or twisted repeatedly. Its attenuation is lower than that of stranded-conductor cable. 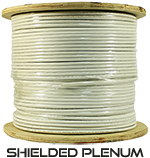 Stranded cable is for use in shorter runs between network interface cards (NICs) and wallplates or between concentrators and patch panels, hubs, and other rackmounted equipment. 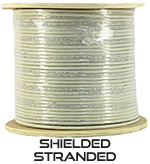 Stranded-conductor cable is much more flexible than solid-core cable. However, attenuation is higher in stranded-conductor cable, so the total length of stranded cable in your system should be kept to a minimum to reduce signal degradation.